At first glance you might look at Medal of Honor: Warfighter with a cynical mindset. Afterall, the original ‘rehash’ of the series was lacking to say the least. What you will notice right off the bat is recoil in your weapons from the gameplay perspective. This game is a more arcade-like game from the run and gun perspective on multiplayer rather than the Battlefield 3 perspective of objective based gameplay and XP development. Warfighter’s maps seem forced and cluttered for the most part. While the Frostbite 2 engine is a nice addition and it gives the ability to destroy cover, etc. there doesn’t seem to be a lot of longevity to a game that isn’t based on larger maps with a lot of cover to destroy. Once again, EA is finding a way to put out a game as a stop-gap measure rather than trying to really overtake Call of Duty. Here is a quick run-down of what you should expect if you are on the fence about buying Medal of Honor: Warfighter. Fast Gameplay – This game plays more like Call of Duty or even the 2010 iteration of MOH, but it is a welcome direction for people that prefer EA shooters over Call of Duty but still want faster gameplay and an overall more ‘reflex driven’ game. The recoil of the weapons makes for a less point and shoot feel, but the small maps and close quarters along with a more assault driven attitude of game-modes makes Warfighter a faster experience overall. Full Weapon Customization – You can pretty much build up any of your weapons to your own specifications. New barrels, new sights, optics, etc. The best part of being able to do these things is that they give you a feeling of ownership and creativity that actually matters. Call of Duty has accessories for guns, sure… but for the most part they are unnecessary ‘bling’. The only thing is that with the maps and game-types in Warfighter, is it really that vital to have all these options? Only time will tell. A Somewhat Intriguing Story – It isn’t often that we can say a FPS title has a story worth paying attention to. Medal of Honor feels more like the movie ‘Act of Valor’ than some sort of half-cocked terrorist fiction. On the other hand, maybe that is exactly what it is… *shrug*. Warfighter grabs the gamer by the heartstrings with a story that feels very real in today’s modern terrorist obsessed culture. However, it is also a game about terrorists being chased around the world. I think I have played this game before. Feels Like A Stop-Gap COD Wanna-be – The bad part of MOH: WF is that it feels like Call of Duty without the urgency. Call of Duty is fast paced, run and gun, twitchy and an overall ADHD experience. Warfighter is all of those things without the twitchy control feel. This makes for a fast paced game with sluggish handling. I appreciate the effort to speed up the feel but this game needs to make up its mind. Too Little, Too Late – With the likes of Halo and Call of Duty coming out in the next three weeks MOH is looking like something to buy if you have $60 to throw away. 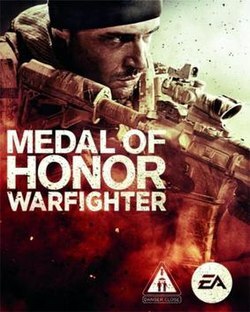 This feels a lot like the 2010 release of Medal of Honor where it had a toe-hold for a couple weeks before Call of Duty came out and made people forget about playing a game with a lumberjack on the cover. A Possible DLC Money Pit – One of the most annoying aspects of this current generation (and future generations) of online console gaming is downloadable content. Sure, DLC is something that is a must for games like Medal of Honor, but in reality you are starting to see a trend of games that come out with DLC already planned to take money out of your wallet. Purchasing Warfighter brand new comes with access to a couple new maps but in reality it isn’t much of a perk if you don’t plan on being completely devoted to this game for the next year. I don’t foresee Medal of Honor being played by many people when Battlefield 3 is already successful enough with its community and Call of Duty gamers will get their annual re-hash and pour money into DLC and ‘Elite’.